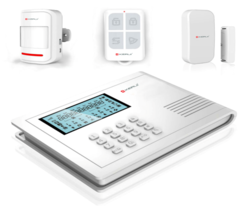 Offering you a complete choice of products which include burglar alarm panel and wireless burglar alarm. 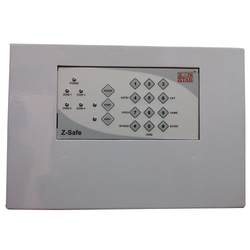 We are a significant organization, engaged in offering an enormous range of Burglar Alarm Panel. Can easily be operated from any remote place through telephone, the offered alarm panel is checked in terms of quality so as to deliver a defect free range. This alarm panel is designed with sophisticated technology keeping in mind the diverse needs of the customers. Zone Chime: A During Disarm, if Zone 1 & Zone 3 (if set as Instant) Violated, there will be 3 chime beeps during Home Mode Arming, if zone 2 violated, there will be 3 chime beeps. Primary Power Transformer: 15 V AC, 1.5 A Secondary: 230V AC, 50 Hz Primary. Large LCD Large English blue back-light display, voice prompt, ease of use. Support dual-network of both PSTN landline and GSM mobile network, provide redundancy for extra stability. Can check status and call records from the panel. Allow up to 99 wireless defense zones and 4 wired zones. Support configuration via phone (handset) or SMS. Message to System Setup text messaging costs associated with the alarm panel. Different zones can dial a preset telephone number. Support ISD automatic voice mailbox for playback message upon the alert. The maximum length of the voice message is 10 seconds.